Recent years have seen the word ‘omnichannel’ introduced as describing the goal of customers being able to contact (and be contacted) through any channel – switching between them during the interaction as appropriate, while taking any relevant data and history along with them – with a single, unified view of the customer’s journey being available to the agent. Omnichannel: “We offer a choice of channels, and can use more than one over multiple interactions while retaining the history and context of the original inquiry. 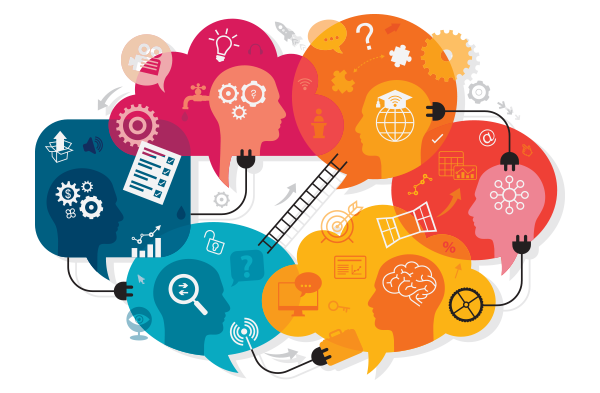 Relevant information follows the customer across channels and interactions”. 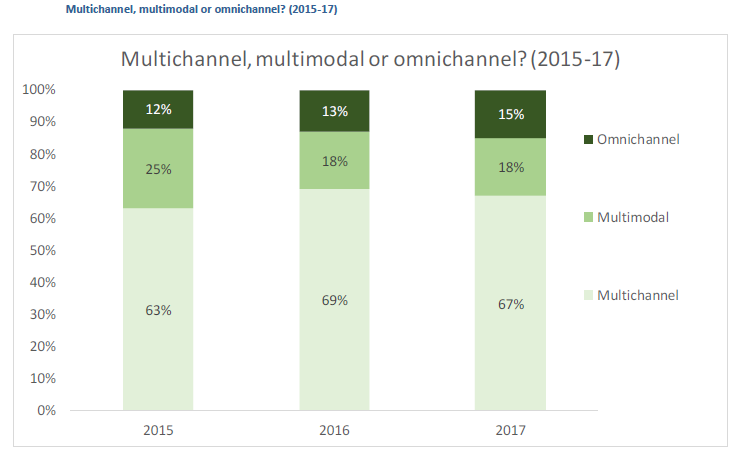 In 2017’s survey, 15% of respondents described themselves as omnichannel, with 18% assessing themselves as multimodal and 67% multichannel, with only a small increase in omnichannel since 2015. Clearly, the industry acknowledges it still has quite some way to go. 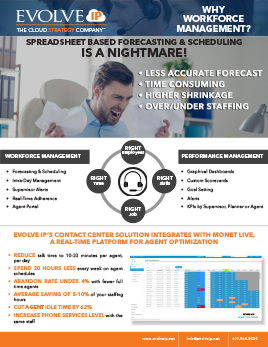 A factor based on contact center size seems to be emerging – smaller, sub-50 seat operations were more likely to identify as either multichannel or multimodal than larger operations – as the investment and process optimization involved in moving to a true omnichannel environment is significant, with the platform, infrastructure, applications and resources available to identify, route and switch interactions between agents and channels seamlessly while keeping all relevant data gathered in the course of the interaction requires major effort and investment. Additionally, the relatively low volumes of digital interaction in smaller operations will make major investment less likely. While these inhibitors to omnichannel are formidable, they are not insurmountable. From a technical viewpoint, the starting point is to have a single integrated platform that is capable of identifying a customer regardless of the channel which they choose to use. This will involve mean evolving from the siloed, channel-focused point solutions that were put in place to handle a specific need, and using a services architecture that is extendable to different channels in the future. It is also important to have a master dataset for product and customer data which is a single source of information that can be drawn upon in real-time by any customer, agent or self-service application through any channel. 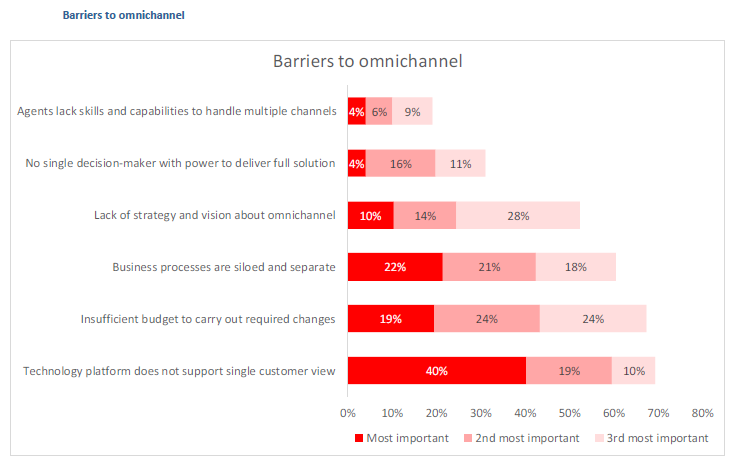 On a positive note, the concern that agents lack the skills and capabilities to handle multiple channels is not seen as one of the major inhibitors to omnichannel: the vast majority of respondents do not feel that this holds them back from offering customers a full omnichannel experience. A key aim of omnichannel is to provide a consistency of customer experience, and this requires access not only to the same master dataset but also that the same knowledge bases and business logic must be applied equally. There must be real-time data flow and updates between channels and databases, as, without this, consistency is impossible. Putting such systems and processes in place will not only allow the seamless escalation of service requests within channels but also gives the business a chance to use their automated systems to react to an escalation before it reaches a live agent, deflecting the cost while fulfilling the service request more quickly. For example, analysis of past interactions may indicate that if a particular customer has placed an online order, they are likely to ring the contact center within 2 days to check on its progress. Making the IVR aware of the customer’s history means that this call can be intercepted before it reaches an agent, and a personalized IVR experience (with the option to “Check your order status”) will reduce customer effort and the time and cost of the agent who would otherwise handle this. 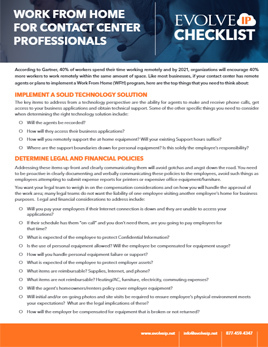 This approach allows businesses to leave their working databases, CRM and multichannel contact applications and infrastructure alone while being able to update and view an individual’s customer record at any appropriate point in the customer journey. 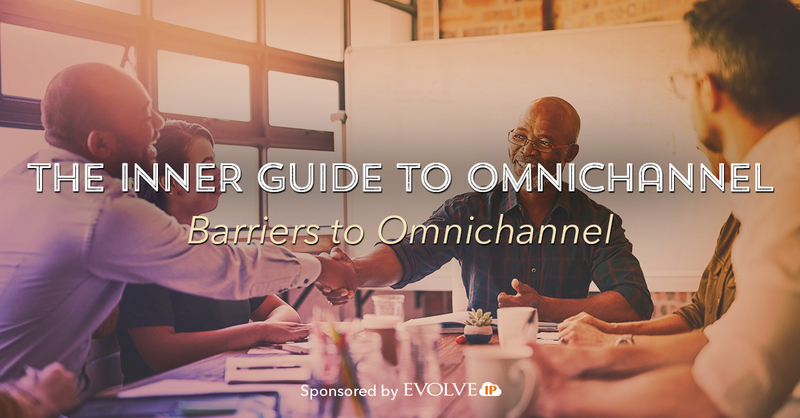 For most businesses, applying an omnichannel strategy to existing customers may be easier than offering the same capabilities to new prospects who are not on the customer database. In order to pass through any relevant interaction history and context between channels, the customer must first be identified, and this is far easier to do the customer has logged in, allowing the system to verify them and access past information. 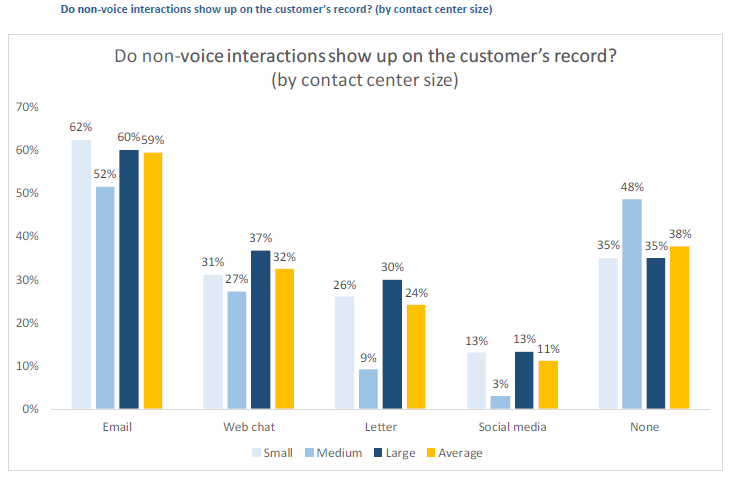 The siloed nature of channels can be shown in the chart below, which shows just how far many contact centers have to go: a large proportion of respondents do not even update customer records with details of non-voice interactions such as web chat, letters or social media interactions. Without this relatively basic information, omnichannel is impossible to achieve. 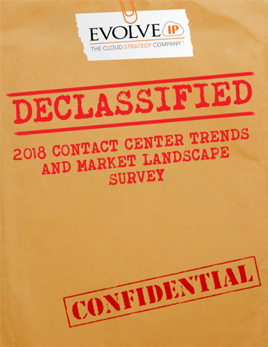 However, one positive finding is that most respondents make sure that customer emails are linked to the master customer record: the challenge is to make sure that all interactions are.